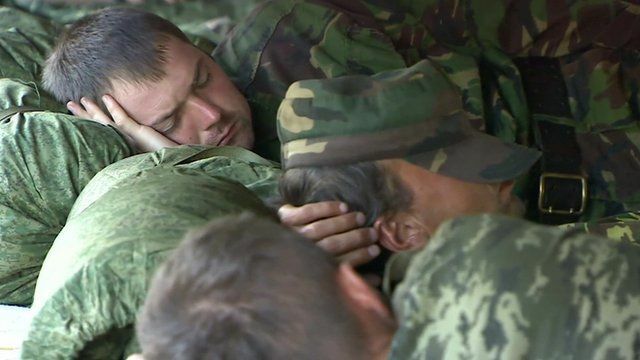 Ukrainian soldiers retreat to Russia Jump to media player The BBC's Steven Rosenberg reports from Russia's border with Ukraine on the 438 Ukrainian soldiers who have retreated to Russia because they are ''under intense pressure''. Ukraine minister: 'We will win' Jump to media player Ukraine Defence Minister Valeriy Heletey tells the BBC the army is close to winning the conflict with pro-Russian rebels in eastern Ukraine. Ukraine forces tighten grip on Donetsk Jump to media player Heavy fighting around Donetsk has seen government forces make strategic advances in their attempt to wrest control of the area from pro-Russian separatists. US and EU expand sanctions on Russia Jump to media player US President Barack Obama announces new economic sanctions against Russia, saying they will make Russia's "weak economy even weaker". Intense clashes halt MH17 team Jump to media player Government forces are pushing rebel units back towards their urban strongholds. Footage shows battle for Donetsk Jump to media player The BBC's Jonathan Beale says artillery fire from the Ukraine military seems to be intensifying in Donetsk. Ukrainian refugees 'just want to survive' Jump to media player Up to 230,000 Ukrainians have had to flee their homes because of intense fighting in the east of the country. Despite strained relations between the two countries, the servicemen have been allowed to enter, and been provided with food and shelter.